. . . the floor was swept and watered, the lamps were trimmed, fuel was heaped upon the fire; and the warehouse was as snug, and warm, and dry, and bright a ball-room as you would desire to see upon a winter’s night. Yes, it’s that special time of year of a very special Second Life Christmas tradition: the telling of Charles Dickens’ popular seasonal tale, A Christmas Carol. And this year, it will be a very special event. For 2014, things will be a little different. 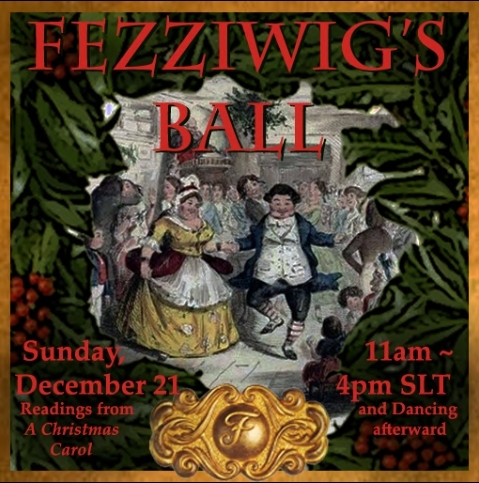 Forming a part of Fezziwig’s Ball, which will be held on Sunday, December 21st, commencing at 11:00 SLT, there will be a special reading of A Christmas Carol by the StoryFest SL team, taking place over approximately four hours, and Second Life residents are invited to drop in and listen throughout. 14:00: Staves Four & Five, “The Last of the Spirits” & “The End of It” – Corwyn Allen, Freda Frostbite, and Dubhna Rhiadra. Shortly after the conclusion of Stave Five there will be a very special ball / party, with suitably festive music supplied by Dubhna Rhiadra, and to which all are invited, “put on your dancing shoes and dance like it’s 1843!” (period costumes welcome, but optional!). The ball will celebrate both the festive season, and mark the closing of the StoryFest SL storybook, as the organisers seek to focus more of their time and resources on some exciting new projects and work. Having attended previous readings of A Christmas Carol by the folk at StoryFest SL, I can state without hesitation that they are always a pleasure to attend. So, if you enjoy this story of grumpy old men, ghosts and redemption, then pour yourself a glass of mulled wine, grab a mince pie or two and hop over to Imagination Island. On a personal note: as this is the last event that will be held under the StoryFests SL banner, I’d like to offer my thanks to those who have, since 2011, both organised and participated in StoryFest events: StoryFest itself, BOOFest, Bard on the Beach and, of course, The Dickens Project. Note: while this is not a fund-raising event, any and all tips received will benefit The Community Virtual Library, who are hosting the event on Imagination Island. 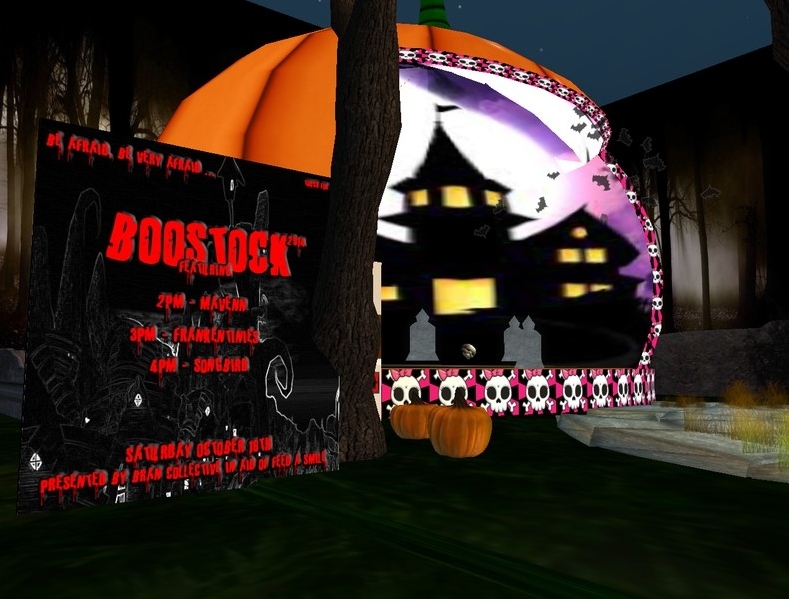 This year’s BOOFest is being held at Lavender Fields, the home of Feed A Smile in Second Life, with all tips going directly to the work of LLK in Kenya. Story sessions will include everything from classic authors of the ghostly to the macabre, from Bram Stoker and H.P. 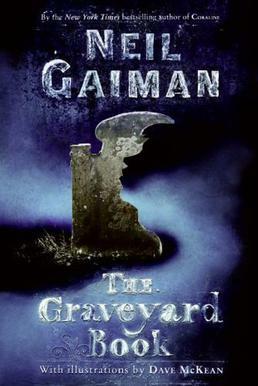 Lovecraft; through to contemporary writers such as Neil Gaiman. In addition, original works by SL authors Freda Frostbite, Dubhna Rhiadra, Caledonia Skytower, and Moon Aerandir will also be included. One not to be missed – check the schedule on the StoryFests SL website. There’s an old saying that no good deed ever goes unpunished. Such is the case for Captain Pausert, inexperienced space trader, skipper (and sole crew member) of the old Venture. He’s just starting to feel he might make it as a trader dealing in cargo no-one else will handle when he is persuaded to take aboard three young girls who had been enslaved on the planet Porlumma …. and things go rapidly awry from then on. Catch-up with Pausert’s adventures and Gyro Muggins pulls out a selection from the books. Tuesday October 21st,19:00 More Poe! Caledonia Skytower settles down to read from the pages of the Master of the Macabre himself. Are you sitting comfortably with the lights down low? 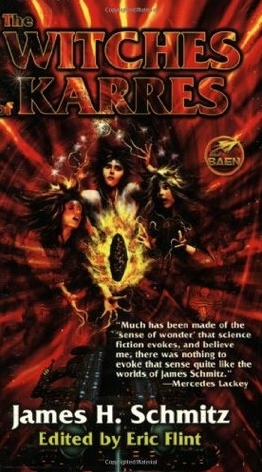 Constance Elaine Trimmer “Connie” Willis is an American science fiction writer. 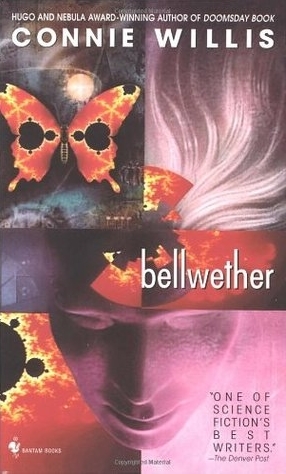 She is one of the most honored science fiction writers of the 1980s and 1990s. Her books have between them won 11 Hugo awards, seven Nebula awards and four Locus awards, making her the recipient of more major science-fiction awards than any other author. 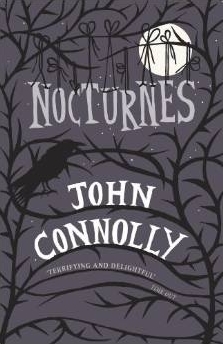 Nocturnes marks Irish author John Connolly’s first anthology of short stories involving lost lovers and missing children, predatory demons, and vengeful ghosts, a latter-day grim reaper and vampiric wives – and much more besides. Echoing genre masters such as M R James, Edgar Allen Poe, H.P. Lovecraft and Stephen King, Connolly delves into our darkest fears through a series of tales including The Underbury Witches, in which two detectives are faced with the ultimate in female evil and The Ritual of the Bones, where a boy at a boarding school who comes to face the dark side of the British class system. There are even two novella’s included in the volume, The Reflecting Eye, which sees the return of Connolly’s private detective hero, Charlie Parker, and the initial story within the book, The Cancer Cowboy, charting the progress of a modern-day grim reaper, a complex individual attempting to understand exactly who or what he is, and why he must be so. Join Shandon Loring as he once more dips into Connelly’s tales to bring you another helping spooky stories. Saturday October 18th and Sunday October 19th mark two special Halloween-themed events, both of which aim to help raise funds for Feed A Smile, the a programme run by Live and Learn in Kenya (LLK) to provide nutritious warm lunches for over 400 children in Kenya every day, paid for entirely from donations to the project. First up, on Saturday October 18th is BOOStock! – Branwen Arts’ special mix of seasonal music and more to be held in a suitable venue floating above the estate. 16:00 – Songbird Sorbet, the tiny opera singer. Then, on Sunday October 19th, it’s time to enjoy the 4th successive year of BOOFest, a celebration of spooky stories told around a blazing autumnal fire. 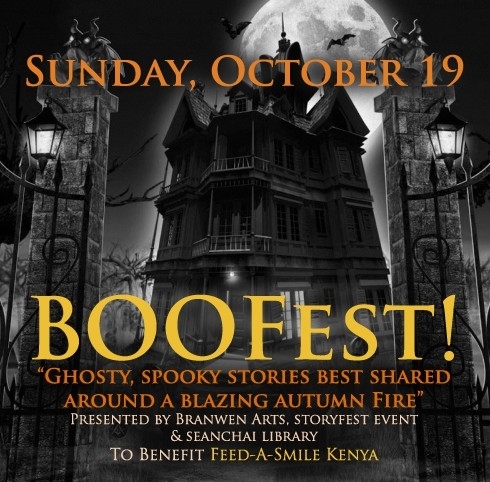 Featuring a gathering of virtual story presenters at their spooky and scary best, this year’s BOOFest is being held at Lavender Fields, the home of Feed A Smile in Second Life, with all tips going directly to the work of LLK in Kenya. Details of any changes to the programme can be found on the StoryFests SL website. Again, admission is free, and all are welcome! Feed A Smile is a programme run by LLK to provide nutritious warm lunches for over 400 children every day, paid for entirely from donations to the project. Over a third of the money directed at the programme comes from donations received through Feed a Smile in Second Life – and that’s a remarkable figure. The money is raised through live music played at the Lavender Fields club, which stages around 5 or 6 events weekly and to which musicians donate their tips and visitors are asked to donate just L$100 ($0.30), which is enough to purchase a filling meal for a child in Kenya, a fact that within itself is quite mind-boggling. Seanchai Library (Shanna-key, which means “Storyteller” in Irish.) was born in March of 2008 as the West of Ireland Library and Cultural Center. Nearly seven years and thousands of story session later, Seanchai Library remains dedicated to promoting the power of stories to transform and inspire through live voice presentations in Second Life and on the Hypergrid, as well as promoting the work of a variety of charitable organizations every year. 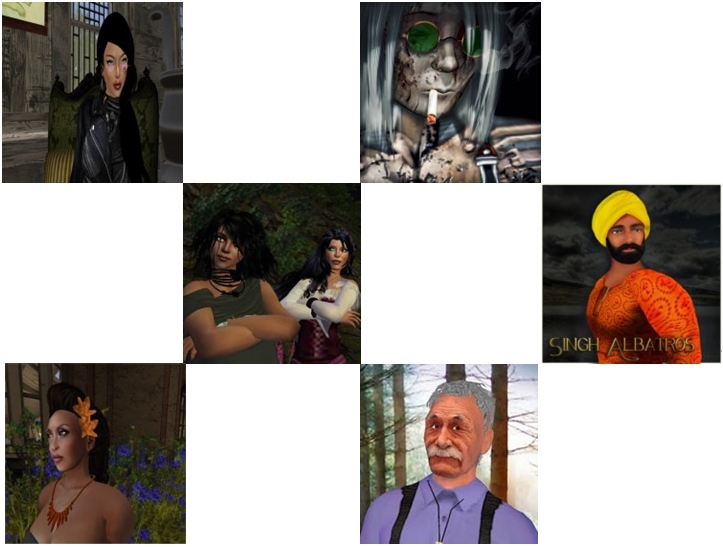 “We bring stories of all kinds to life, in virtual worlds.” Contact Caledonia Skytower. Branwen Arts Cooperative is a group of artists who work singly or together with other artists. Their home base on Bran in provides a stage for performance and a gallery for exhibitions. Branwen Arts is always looking for artists, visual and performing, who want their work to be seen and appreciated: writers, storytellers, dramatists, visual artists, dancers, musicians. Contact Dubhna Rhiadra, Fae Varriale or Safi Farspire. It’s another feast of stories at Storyfest! 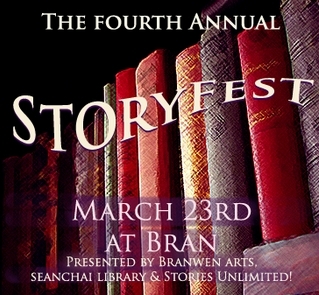 Storyfest 2014 arrives a Bran on Sunday, March 23rd, and with it comes a host of storytellers with tales to delight and enthrall. This year marks the fourth anniversary for this one-day event, presented by Branwen Arts and Stories Unlimited. The even will kick-off at the Story Circle in Bran at 11:00 SLT, and all donations made during the course of the day’s events will benefit War Child North America. There will be a break in proceedings at around 13:00 SLT, and do note the schedule is subject to possible last-minute revision. 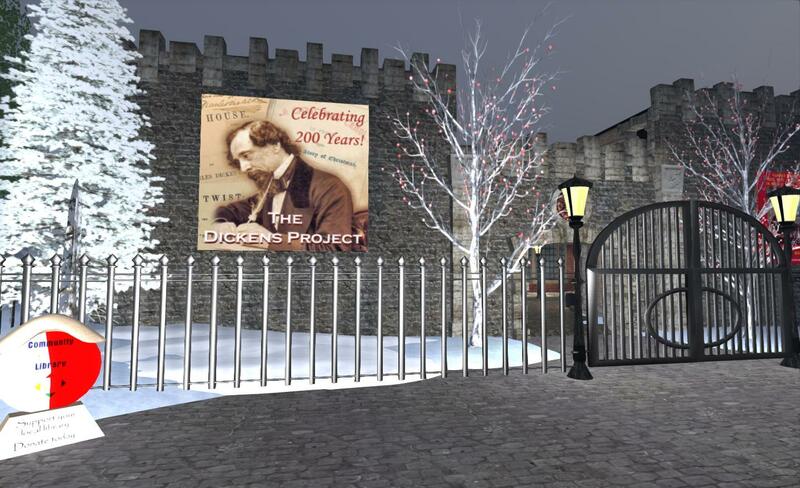 StoryFest Events produces four annual festival events on the Second Life grid: StoryFest (March), Bard on the Virtual Beach (August), BOOFest (October), and The Dickens Project (December). Storyfest 4: Step forward and be heard! Branwen Arts and Stories Unlimited have announced a call for performers at the Fourth Annual Storyfest event, to be held on Sunday March 23rd, 2014. StoryFest is a partnership between the Branwen Arts Coop, Seanchai Library and the Stories Unlimited, and produced by StoryFest Events. It will take place at Here Be Pictsies in Bran, commencing at 10:00 and running through until 17:00. The event is held to mark World Storytelling Day, which celebrates traditionally told tales, and which this year falls on March 20th, with the theme of Monsters and Dragons. Storyfest will comprise a day of stories presented in a variety of live performance forms: traditional telling, literature, theatre, dance, and so on. Anyone who is currently presenting stories in Second Life in any manner of live performance (i.e. not pre-recorded readings / performances), are welcome – and encouraged – to apply. Performances should be timed to fit a 30-minute slot, although there are a limited number of 60-minute slots for more elaborate presentations. Multiple performers can share a single slot, so long as the organisers are aware of how many and who as a part of the application. Note that no streams will be available for individual performers. The organisers are also seeking volunteer hosts to help organise and run the day’s events. A reference to what and where you present on the grid at present. All submissions should be received no later than midnight SLT on Wednesday March 12th, 2014. successful applicants will receive confirmation by Tuesday March 18th March, and a schedule for the event will be published at that time. Questions on the event should be addressed to Caledonia Skytower or Dubhna Rhiadra by note card, as IMs do frequently get capped. In 2012, to mark the Dickens Bicentenary Year, the folk at Storyfests SL organised The Dickens Project, a 13-day celebration of Dickens’ work, primarily focused on A Christmas Carol, but which included selections from other novels and short stories. Over the course of the event, 20 hours of readings and performances took place, featuring an international cast in a purpose-built themed environment in Second Life. The latter not only reproduced the world of Dickens’ novels, but also provided a number of levels of interaction for visitors and audiences, allowing them to learn more about Dickens’ life and works, and the era in which he lived. In June, I reported on moves to broaden The Dickens Project as both a real life and virtual experience, as explained by the project’s creator and producer, Caledonia Skytower in a video which looked back at the December 2012 event as well as looking at the future potential for the project. Now, a part of this potential is to be realised. 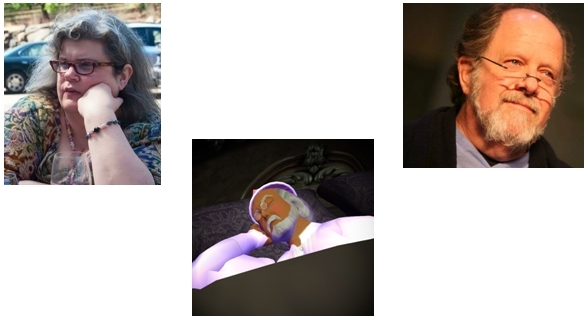 In December 2013, and for a single performance, The Dickens Project will cross the divide between the real and the virtual. At 13:00 on Sunday December 1st, three noted voice actors will give a special reading of A Christmas Carol using a text adapted and annotated by Dickens himself when he presented the story in person, together with some additional text from the full novella. 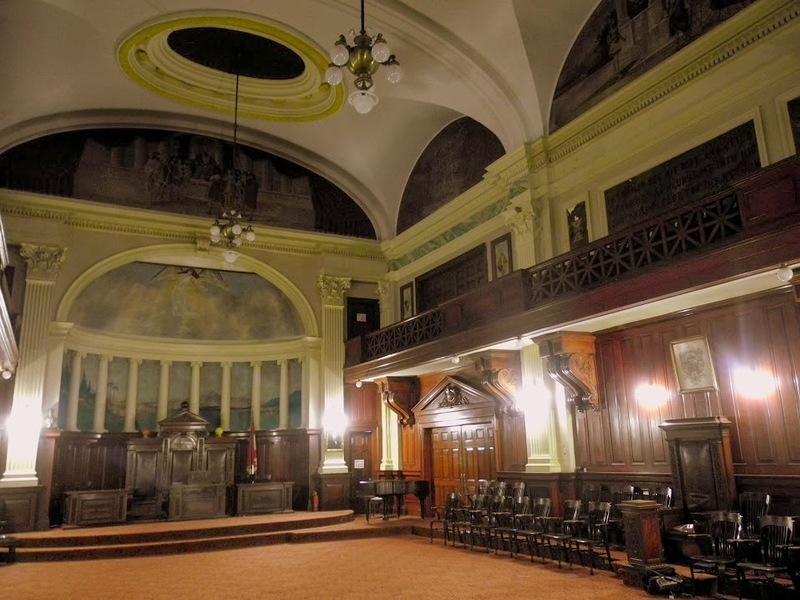 The event will take place at the Knights of Pythia Temple in Tacoma, Washington, USA; however, only one of the artists will be present in person in the form of Judith Cullen, Caledonia Skytower’s alter-ego. Both of the remaining two players for the piece, actor, director, stage manager and playwright Kevin Lee (SL: Kayden Oconnell), and the Seanchai Library SL’s Chief storyteller, Shandon Loring (playing the central role of Ebenezer Scrooge), will be joining Judith through the magic of Second Life, and their presence at the in-world Dickens Project set will projected onto a large screen at the Temple. The RL / SL cross-over performance will feature both in-world and real life audiences, and while free to both, donations will be accepted with proceeds from real life benefiting My Sister’s Pantry and those from the the virtual world benefiting War Child North America. The performance will come ahead of a season of in-world performances of The Dickens Project which is due to commence on December 12th, 2013. I’ll be providing more details on this in the coming weeks.